Book value of an asset denotes its accounting value, which is nothing but the historical cost less accumulated depreciation/amortization. Market value of an asset represents the actual market price of the asset, that is traded in the market place. It can also be understood as the actual worth of the firm relating to other firms in the marketplace. Book Value, as the name signifies, is the value of the commercial instrument or asset, as entered in the financial books of the firm. On the other hand, Market Value is defined as the amount at which something can be bought or sold on a given market. People find it a bit difficult to identify, which one will prove the best for an investor to consider before investing his money in the company. 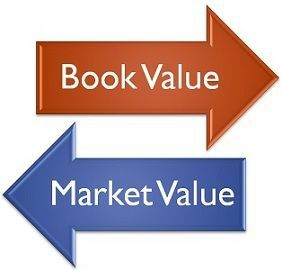 These two values may vary, or they may be same but above all, you must know that the difference between book value and market value will show you the profit or loss. Conversely, if the values tally then there would be no profit no loss. Meaning Book Value means the value recorded in the books of the firm for any asset. Market Value is that maximum price at which an asset or security can be sold in the market. What is it? It is the actual worth of the asset or company. It is a the highest estimated value of the asset or company. Basis of calculation Tangible assets present with the company. Tangible and intangible assets, which the company possesses. Book Value, for assets, is the value that is shown by the Balance Sheet of the company. As per generally accepted accounting principles, the asset should be recorded at their historical cost less accumulated depreciation. In the case of a company, the book value represents its net worth. It can be calculated by reducing the total liabilities and intangible assets from the total assets. It is the amount which will remain with the company if it gets liquidated immediately. Such an amount is expected to be distributed among the numerous shareholders. Market Value is described as the maximum amount that a buyer is ready to pay for an asset in a competitive market is known as Market Value. It is the value at which the trading of the asset is done in the marketplace. Now if we talk about the market value of a company, it is the value of the public company. It is popularly known as Market Capitalization. Market Value is the result obtained through the multiplication of the total number of shares with the current market price per share. It is a certain amount, but its basis is not definite, i.e. the current market price of a share is determined on the basis on which the company’s trades take place. There are end number of factors can influence the market value of a company like profitability, performance, liquidity or even a simple news can increase or decrease its market value. The value of assets or securities as indicated by the books of the firm is known as Book Value. Market value is that current value of the firm or any asset in the market on which it can be sold. Book Value is the actual worth of an asset of the company whereas Market Value is just a projected value of the firm’s or asset’s worth in the market. Book Value is equal to the value of the firm’s equity. Conversely, Market Value shows the current market value of the firm or any asset. Book Value changes annually, but Market Value changes every next moment. For the calculation of book value, only tangible assets are taken into consideration, but market value considers both tangible as well as intangible assets. Book Value is always readily available, however, the projection of market value on the current market price of a single share, it is not readily available. When the book value is greater than the market value there is profit, but if the book value is less than the market value there is a loss. However, if these two values coincide, there is a situation of no profit no loss for the company. It is easy to calculate as the information exists in the company’s balance sheet. The information will be useful to the investors, in deciding whether to purchase the stock or not. It shows the actual cost or outflow or acquisition cost of the asset. It does not fluctuate easily unless the capital structure of the company changes. According to the financial economist, market value shows a clear picture of the intrinsic value. It is suitable for new projects, that require an inflow of capital. It reflects the current market trends. Balance Sheet items are shown in book value as per Generally Accepted Accounting Principles (GAAP). On the other hand, according to International Financial Reporting Standards (IFRS), the assets will be reported on the balance sheet at their fair values. IFRS is expected to be adopted by all the countries soon. After the adoption of IFRS, the divergence between the two values will be reduced.